GHOSTSHIP - art-by-mimuluxs jimdo page! sometimes the ghostship brings back memories to us, ghosts which we faintly remember or have forgotten alltogehter. these ghosts can be happy, friendly, dark, scarey... but they are part of us and part of our past. we learn from those ghosts, each one has brought a lesson to us, a lesson for us to grow from and to make us stronger. 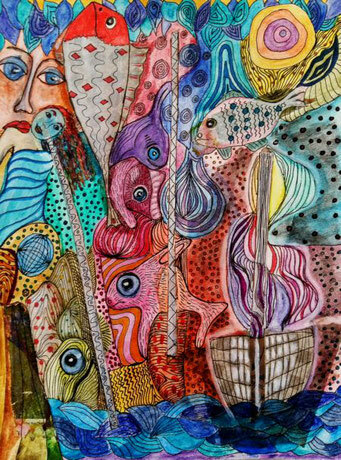 the mermaid and the fish are there as friendly spirits, observing ... in the background the universe is watching..